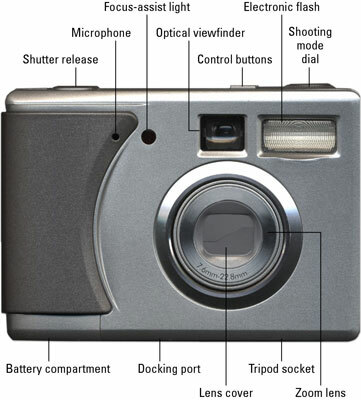 The front of a typical digital camera. The back of a typical digital camera. Shutter button: Press this button all the way to take a picture. Control buttons: Adjust various camera settings. Shooting mode dial: Change among different scene modes, adjust exposure choices, and so on. Microphone: Capture audio for movie clips and voice annotations, or even activate a sound-triggered self-timer. Focus-assist light: Helps the camera focus in dim lighting conditions. Electronic flash: Provides addition light to your scene. Optical viewfinder: To frame and compose your picture. Zoom lens and control: Magnifies or reduces the size of the image. Tripod socket: Allows you to attach the camera to a firm support. Docking port: Can be used to transfer photos, recharge the batteries, make prints, or perform other functions. Battery compartment: Contains the cells that power the camera. Power switch: Turn the camera on or off. Indicator LEDs: Show the camera’s status. 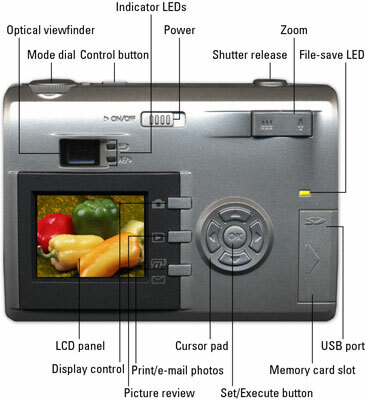 LCD (liquid crystal display) panel: The camera’s display. Display control/Menu button: Controls the amount of information shown in the LCD and menus. Picture review: Press this button to review the pictures you’ve already taken. Cursor pad: Navigate menu choices. Set/Execute button: Activate a feature or set a menu choice to the current selection. Memory card slot: Accepts digital memory cards. USB port: Access for a USB cable. File-save LED: This light usually lights up to indicate that an image is being saved to the memory card.